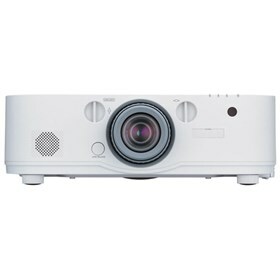 The NEC NP-PA622U is 5200-lumen 0.76" LCD advanced professional installation projector with MLA, TileMatrix and ECO Mode™ technology. The projector has automatic keystone correction, cornerstone and geometric correction. It features high performance video processing/scaling, advanced AccuBlend, AutoSense and built-in wall color correction. The NP-PA622U also features multi-display support, closed captioning and virtual remote. It is ideal for integrated software applications such as Crestron Roomview, AMX Beacon and PJ link allow for complete control. The projector has complete line of 5 bayonet-style lenses which allows for quick and easy lens exchange. The NEC NP-PA622U has many exciting features for users of all types. See the NEC NP-PA622U gallery images above for more product views. The NEC NP-PA622U is sold as a Brand New Unopened Item.